Commonly used for : Asset Financing, Working Capital Financing, Revolving Credit, Islamic Overdraft, Personal Financing, Home Financing, Credit Cards, Profit Rate Swaps, Interbank Placements. For the past few years, controversies have arisen over the use of several working capital products, which aims to provide one party with cash and another with debt. As with all Islamic transactions in the market, an underlying asset is a key requirement to ensure the transaction is valid in the Islamic Banking world. The main challenge for a customer requiring cash for their use but without any collateral or asset to enable the economic transaction to take effect, Banks have obtained alternative structures to provide the customers with the much-needed cash. The structures of Bai-Inah and Commodity Murabaha are introduced as possible solutions.The word Tawarruq is also greatly been used to reflect transactions involving Commodity Murabaha. 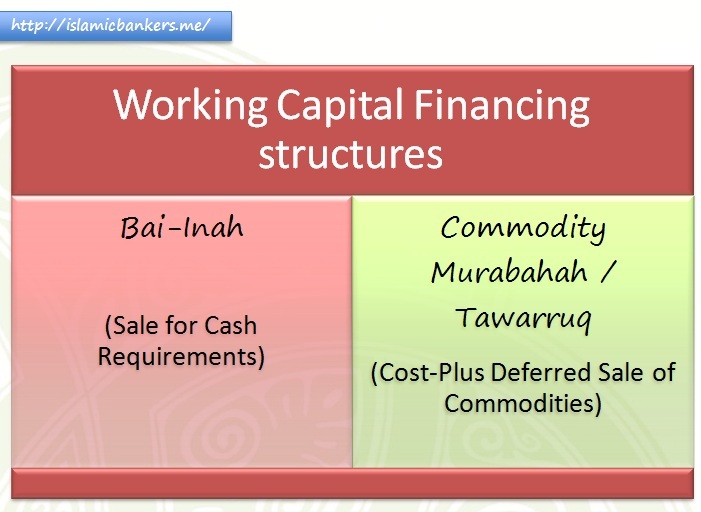 Although the Bai-Inah structure is generally rejected by international scholars except for in Malaysia, the remaining Tawarruq arrangement with Commodity Murabaha are still accepted throughout the Islamic Banking world. Lately however, even this contract is put under pressure by scholars as something nearing its shelf life. Recent pronouncements by some scholars that the Tawarruq arrangement is not permissible only highlights the challenges in Islamic Banking. The main argument against Tawarruq arrangement with Commodity Murabaha is the same one; that the structure is “arranged” and therefore is not a genuine economic transaction. But for proponents of both Tawarruq arrangements (even for Bai Inah), the question is that, unless a structure exists that provides cash while in the absence of valuable assets, should Islamic bankers continue to offer these structures in the meanwhile? Or divert the customer to conventional banking product which is clearly involved in Riba’? There are no easy answers to this as it depends on which side of the fence you are standing. WHAT IS COMMODITY MURABAHAH OR TAWARRUQ? There has been on-going questions on the validity of the contract and the rationale for doing so. The Legal Maxim used is that Tawarruq satisfies people needs and meets their requirements i.e. removing difficulty as well as meeting the Maqasid of Shariah for protection of property. This structure is required in the face of today’s difficulty in addressing liquidity requirements. In order to overcome the option of reverting to a riba’ based facility to meet Customer’s need, Tawarruq is provided as a solution for their problems. Generally, the Tawarruq terms are commonly used in the Middle-East and Commodity Murabaha more popular in Malaysia. Between scholars and practitioners, these terms are now used interchangeably. But in my humble opinion, I subscribe with BNM view that Tawarruq is the over-arching arrangement where multiple contract work together; Wakalah, Murabahah and Musawamah to complete the Tawarruq arrangement. We have to first ask this question, Is there anything fundamentally wrong with the contract of Tawarruq? Why is it being put to question? In the olden days, this structure would be a normal trading scenario, where there is real sale transactions involving goods or commodities. All the tenets of a valid sale can be met (Buyer, Seller, Price, Asset, Offer & Acceptance) and there should not be any issues of interconditionality. A person needs Cash to run his business. Lets say he has an immediate business opportunity to earn 40%-50% returns for the year, but he needs $100,000 to do it. He looks around the market for a liquid commodity that can be sold quickly for Cash. Let’s say he identified there is need for Cocoa Beans by a few buyers. He approach a Cocoa Beans supplier (maybe direct from the plantation) and negotiates a deal for the beans. He offered to buy the beans (worth around $95,000 to $100,000) for a price of $120,000 to be settled in 12 months time. This is a Murabaha for purchase of Commodity transaction (in other words, Commodity Murabaha i.e. Profit Sale using Commodities). Murabaha is an accepted Sharia compliant sale-contract. Once the supplier agrees to this deal, he takes ownership of the Cocoa Beans (worth around $95,000 to $100,000). Now, it is not his intention to just “own” the Cocoa Beans (as he needed Cash for his business) so he will use the Cocoa Beans as Commodity goods to sell in order to obtain Cash. Is there any thing wrong with that? He plans to use the proceeds for his business to generate economic benefit for him. This is his main intention. As he already identified the buyers of Cocoa Beans in the market, he approaches them to sell the Cocoa Beans under contract of Musawama (simple sale). He may eventually sell all the beans for $100,000, but he may even get more than that, depending on his negotiation skills. All he needed was to obtain Cash of $100,000 for him to proceed to do his business which may earn him up to $150,000 for the year. He makes the sale at the market price on Cash-basis and managed to collect $102,000 which is sufficient for his requirements (with additional estimated up-front profit of $102,000 less $95,000 = $7,000). Again, nothing wrong for this profit deriving from a sale transaction, as he has taken some ownership & valuation risks by buying the beans. With that Cash, he funds his business and finally earns a profit of $147,000 (about 44% profit per annum) from the capital of $102,000. On the 12th month, he pays off the debt with the Cocoa Bean supplier for $120,000. His net profit will therefore be $147,000 less $120,000 = $27,000. All the underlying transactions are based on valuable, real and deliverable assets which meets the requirements of the Sharia. Having dedicated personnel skilled in the booking of commodities that is able to identify “highly liquid” commodities that is in demand and easily sold (disposed) in the market. Crude Palm Oil (Malaysia) and Non-Precious Metals (International – London) are the commonly used commodity due to its stable and continuous demand for the commodities. Having developed internal systems that is able to track and monitor the evidence, ownership and movement of the commodities used. Having established relationships with commodity brokers and commodity bourse in where the trade transaction will happen. Having clear processes that is controlled and monitored to ensure proper sequencing and transfers in accordance to Sharia rules and regulations. Having Sharia-approved documentations to capture the debt obligations created from the Murabaha sale of commodities. A buyer (Customer) buys an asset from a Seller (Bank) for a deferred payment (either periodic instalments or lump sum settlements). The buyer (Customer) subsequently sells the asset (via an appointed Agent) to a third party (on-sell as Musawamah) for cash at a price less than the deferred price (usually equivalent to the original purchase price), with the objective of obtaining cash. The terms of the transaction is agreed up-front by both parties, including the type and price of commodities to be transacted, and the settlement details. The above transactions must be executed based on the sequence and in a timely manner. The purpose of the above arrangement is to obtain immediate cash and not for the purpose of acquiring the Asset or benefiting from the commodity. The commodity transaction is a means to facilitate the attainment of cash and liquidity, and while the beneficial commodity ownership must changes hands during the transaction, it is rarely the case that the Customer actually takes physical ownership of the commodity (as this is not the main intention of the Customer). However, the option to take physical delivery of the commodity must always be present to the Customer should they choose to take the physical delivery. Another key consideration is that the contract must stand-alone and not be conditional on the completion of the other contract. The arrangement of Tawarruq is a combination of 2 separate contracts that are complete and therefore legally binding on its own. Based on the above structure, the Tawarruq arrangement must clearly consist of 2 separate standalone contracts. The legal documentation, as far as possible, must also reflect the same. The preference of using Tawarruq (transaction of Murabahah involving Commodities) instead of Bai Inah (transaction of Murabahah involving Bank’s Assets) is the issue of interconditionality. Under Bai-Inah, the underlying Asset used is the Bank’s Asset i.e. Bank sells its Asset to Customer to create a debt and “buy-back” the Asset from the Customer for immediate Cash settlement. It puts the structure under extreme criticism as it is argued that this is a pre-arranged transaction of no economic value just for the purpose of creating a debt, without the ability to separate the sale and the buy-back contract. The interconditionality clauses built into the transactional documents to ensure the buy-back makes the contract now “un-preferred” by scholars in general. Under a Tawarruq arrangement, it is deemed that the interconditionality aspect of the contracts are immaterial. This is because the Bank has no use of the commodity being traded, since it is a non-Bank Asset (not used by Bank) being traded by third parties in the open commodities market. The Bank simply has no interest to “buy-back” or even keep the commodities in their books, therefore it enters into an actual economic transaction done between 2 brokers. While the transaction itself doesn’t value-add to the commodity, the trading of the commodity allows for the creation of debt necessary for the customer. The common criticisms revolves around the issue of ownership (constructive ownership vs physical ownership) as the commodities are usual located off-site and the ability to actually verify the commodities being traded is in existence and as per the description or not. It is because these criticisms that some countries (like Oman) still stay away from these “working-capital” product structures. However, most of the established commodity brokers have started to make available nearby commodities warehouse locations, nearer to many business locations. For example, a commodity broker may set up a warehouse in Singapore to cater for the commodities requirements from Malaysia, Indonesia and Brunei. This helps address Shariah Committee concerns as these commodities become more accessible for inspection, and ownership verification. Interconditionality in Tawarruq arrangements. As mentioned above, one of the major criticism of Tawarruq’s predecessor i.e. Bai Inah structure is that the interconditionality of the 2 contracts. Under Bai Inah, the legal requirements imposes that the Customer must execute Contract #2 for the compulsory buy-back of the Asset by the Bank, failing which Contract #1 becomes invalid. This issue is however mitigated under Tawarruq as the Bank, using third party commodities, has no interest to impose a buy-back of the commodity from customer thus removing the need to impose controversial interconditionality clauses. Commodities used for transactions. Another concern is that the commodities used for the transaction has little value, obsolete or defective, requiring scholars to emphasis the evidence, valuation and good order of commodities must be ascertained before a transaction starts. There has also been concerns whether the commodity really exists in its current form in the stated commodities location. Efforts have been made to verify and authenticate the existence of those commodities with scholars taking the initiative to visit the location where the commodities are stored. Physical delivery of Commodities. The concern on the inability to deliver commodities to the Customer, should a delivery request be made, will render the arrangement of Tawarruq defective and is not in the right spirit of the contract. It may be construed as an economic trick. The condition, availability and location of the commodity are important factors to be addressed adequately by the Bank to ensure deliverability. However, the brokers and the various bourses have also built mechanism to prove the deliverability and existence of such commodities to provide comfort to the Shariah scholars. Most have been consistent in providing assurance to the scholars. Agency issues, including dual agency arrangements. There are opinions that the arrangement of dual agency (where customer appoints the Bank to conduct all transactions on their behalf by way of multiple agency appointments, thus removing any Customer interaction during the transaction) deems the arrangement as Organised Tawarruq (Tawarruq Masrafi) instead of Real Tawarruq (Tawarruq Haqiqi). Some prominent scholars, including Mufti Taqi Usmani and some countries (such as Oman) had criticized and/or rejected the use of “Organised Tawarruq”. Additionally, there are also contrasting opinions on the practice in a dual agency where a single person in the Bank acts as the agent to 1) purchase commodity (as customer’s Purchasing Agent) and 2) sells commodity (as customer’s Selling Agent) to himself (as Principal of the Bank). This allowance has been captured in BNM’s Tawarruq Policy Document but is still a talking point amongst practitioners. BNM has therefore put in strict requirements to comply with the adherence to rules of this practice. BNM also conduct detailed checks at banks to ensure compliance. Sequencing and Ownership. Under Tawarruq, the sequencing of the transfer of commodities are so critical that a break of sequencing have a domino effect for transactional defect. Many failed to see how important the sequencing are, because of commodities usually requires quick change in hands and ownership. Many cases we have come across showed breakage in sequencing and therefore rightful ownership to proceed with the transaction. Some cases we can rectify (for example in cases of Bay Fuduli i.e. Purchase made by unauthorised agent due to sequencing breakage), but some may require some drastic ratification, even resulting in loss or charity payments. But as the brokers and various bourses mature and became more efficient, the sequencing issues are largely mitigated and hard-structured into the system to ensure proper sequencing. The level of evidencing has also be increase to provide strong assurance to auditors and Shariah scholars. There have been efforts to introduce a more acceptable mode for commodity trade such as the introduction of Bursa Malaysi’a Bursa Suq Al Sila to make it more transparent the process for the ownership and transaction of a commodity, but the question still remain on how long will this structure be acceptable to the scholars. At the end of the day, this is still Tawarruq which is pre-arranged Commodity Murabaha; none of the parties intend to purchase or hold commodities. The intention is to create debt. Unfortunately, the reality of it is that there is still a huge portion of the market embedded in debt rather than equity trading. Equity is simply not enough to support some transaction, and for an industry that pushes double-digit growth, Tawarruq arrangement and Commodity Murabaha will remain among the key growth enablers to Islamic funding. Bai Inah and Tawarruq were never intended to be the solution to Islamic funding. It is merely providing customers with an Islamic alternative while developers figure out a way to meet customer’s liquidity requirements. Or, the processes governing these structures may be further improved to become more acceptable to more scholars. Practitioners have to be more vigilant in ensuring compliance to the rules of Commodity Murabaha transaction in a Tawarruq arrangement to avoid damaging the reputation of the contract by taking short-cuts. Islamic Banking structures are always meant to be evolving as new discussions are undertaken, new regulations imposed and new solutions found. Until then, Islamic Banks will continue to utilise these structure to avoid customers going into Riba-based loans as their financial solution. Wa’ Allahu Alam. In regards to islamic banking accounts like CIMB’s ‘Why Wait Fixed Deposit’ or Maybank’s ‘Profit Now Account’, how is it possible to have be offering upfront returns upon depositing and guaranteed principal upon maturity? In regards to islamic banking accounts like CIMB’s ‘Why Wait Fixed Deposit’ or Maybank’s ‘Profit Now Account’, how is it possible to be offering upfront returns upon depositing and guaranteed principal upon maturity? As you are aware, these products are based on a sale-based contract (commodity Murabahah) and one of the conditions to Murabahah is the sale price (which includes profit element). While the whole point of Murabahah is the deferred sale element, the so-called “buyer” of the commodity (Banks) have the right to settle the sale price to the “seller” of the commodity (customer) at any time before the settlement date, with or without a rebate on the sale price (rebate is a discretionary right of the seller, not the buyer). On day one, all the sale price obligation is materialised. In this case, the Bank exercises its right to pay the profit upfront, leaving only the principal amount to be paid on the expiry date. The. Murabahah contract remains intact as all the pillars to Murabahah are met (buyer, seller, price, subject matter, offer and acceptance). Thank you for the speedy reply, I really appreciate it. By depositing say, $1M, I’ve appointed the bank as my agent to purchase $1M worth of commodity. The bank purchases the commodity and holds the commodity on my behalf. The bank purchases at deferred sale price and owns the commodity. The bank sells commodity to company Y. Company Y buys commodity from the bank. The bank receives cash from company Y. At maturity, the bank pays the deferred sale price to me and I will receive $1M + x% profit. But if I am able to receive x% profit today, why would I put my $1M in an illiquid position for the contracted tenor period? That RM1.0 million placed with the Bank for 1 year will be the requirement for the taking of the profit up-front. It will have to be illiquid for you as the Bank will be investing that money to earn a return (that ideally be more that what they have paid to you upfront). If you choose to liquidate the deposit earlier than the agreed maturity, the principal returned to you will be the net figure of RM1.0 million less profit up-front (assuming the contract is not tagged to mark-to-market valuation). Technically you will just receive a total of your full principal only, without any profit. I’m sorry, I’m struggling to put my thoughts into words. I understand that upfront profit would entice depositors to place bulky deposits, enabling banks to pool and create bigger resources for other investments. What I meant to ask is, if the bank is able to secure and credit me the profits from sale on day one, where is my, say $1million deposit going in matters of tawarruq’s flow of business? Hi Shafiqah, apologies for replying late. I actually overlooked my response before I realised I responded to your earlier question and not this one. Anyway, I understand your question. To articulate a similar concept is the common Structure Deposits. In Structured Deposits, the Bank will invest your funds in a fixed return instruments. For example you placed RM100,000 as your investment. If the Bank can find an investment that pays 10.00% fixed return p.a. (for example by way of Commodity Murabahah Sale contract), the Bank will be able to offer a rate of return to the customer at 9.09% and pay the profit upfront. The return from the available investment = 10.00% p.a. Therefore, Bank will be able to pay back the customers principal after 365 days, and had paid the profit up-front. Now of course, if the Bank can find a fixed return investment of 11.00% p.a. then the Bank will start earning a profit. It is a matter of the Bank finding the best returns for the actual cash on hand i.e. 90,909.09. Anything above 10.00% is money for the Bank. 10.00% returns is not a reflective returns in the market today, but that’s just for illustration. Again the benefits is that the customer perceive that they are going into a good deal, as they get the profit now, and the principal is guaranteed on maturity. Under the fixing features of Commodity Murabaha / Tawarruq, this means the profits are guaranteed and theoretically it is the Bank’s discretion if they want to pay their “debt obligation” earlier to the customer. In actual fact, this arrangement is already a “managed cash flow” scenario. This, I believe is a very effective value proposition for the customers. Hi i refinance my house for rm260k,,,, In the letter offer its written something about commodity murabahah…. What does that means… My monthly payment is rm1.6k per month…. What benefits ill receive…. thank you…. That’s probably a Hong Leong Islamic Bank financing!!! Commodity Murabahah is a perfectly acceptable contract for any financing facility. All the above structure involves the underlying asset of the subject matter itself (the house) to validate the transaction and contract. However there are certain structures that, coming from various types of issues (for example ownership, warranties, etc) has decided to use an underlying asset which is not the subject matter to validate the contract. The asset is a different asset altogether i.e. in your case, a commodity. The purpose of using commodity is because of certain restrictions in the ownership structure for an existing product. There is no difference in terms of impact to you whether the financing is via commodity murabahah or Diminishing Musyarakah. tq ur info very much appreciated…. You’re welcome. Hope it is of some help. I need your advice on which package is good… I would like to refinance my house… Should i take Commodity Murabahah or Musharakah Mutanaqisah? I am so confused which is better in terms of everything especially costs, legal etc. To be honest, there really is not much difference in terms of package or costing either for tawarruq home or DM home. Perhaps minor differences in stamp duty but that’s probably less than RM100 difference. DM generally have more documents to sign because it is more comprehensive. And under DM, you need to see the documents where there’s specific roles that you need to play and be liable on. Under tawarruq, you just need to ensure you pay the debts only, as it is a debt creation mechanism. So for simplicity, it’s Tawarruq. But net impact, both are the same. Hope that helps. Thank you so much. Now i have clearer picture. Salam En Amir, my company is involved in the trading of LPG (cooking gas) and my bank recently changed our financing facility form (Accepted Bills) AB-i to Invoice Financing-i because they claim that the product being traded should be classified as commodity rather than goods. Now the profit rate is based on BFR and not AB-i rate, which is higher. Please give us your thoughts on this. Apologies for not replying earlier. AB-I is slowly becoming a higher risk proposition to Banks, especially AB-I purchases where it is relying on the contract of Murabahah. There are additional operational and risk elements under Murabahah, with the introduction of the Murabahah standards where holding risks are now expected (Murabahah Purchase Orderer). Bank holds ownership risks and this do translate to some worries to the Bank. I noticed since last year (the year the Murabahah standards were issued) that Banks have become very, very selective in offering AB-I purchases under Murabahah, instead opting to Invoice Financing which can be based on the contract of tawarruq. Under the contract of tawarruq, the ownership risks are mitigated almost immediately as there are willing counterparties to transact the Assets with. As such, a lot of Banks has started to move their portfolio to tawarruq (commodity murabahah), as the default offering, as well as better pricing can be charged by the Bank. A lot of Banks will look to limit their exposure to the AB-I product and promote Invoice Financing instead. Unfortunately, under Invoice Financing, there are also operational risks (such as double financing of invoices) but this allows the Banks to seek higher pricing to compensate the risks the Bank will take. Otherwise, the Banks are just trying to improve profitability by shifting from AB-I to Tawarruq. It is unfortunate that the Banks are re-looking at long time facilities and changing them to improve profitability and liquidity. This allows the Bank to earn more than usual. Talk to your banker on how to get back on the AB-I list. I truly want to say, that your blog related to Islamic Banking concepts are very imformative with proper examples. I take this opportunity to thank you for doing this. But currently I have a doubt pertaining to Tawarruq, which is, when Bank is appointed as an agent on behalf of the customer to dispose the commodity in the market, there will be an agency agreement signed (Wakala agreement) right? Following this, is the bank eligible to charge agency fees to the customer for being and acting as an agent? because the customer is already paying the selling price to the bank which includes profit in it…. Yes there is an Agency contract in a Tawarruq arrangement. And yes a Wakalah agency entitled to a Wakalah fees. But generally, in Malaysia at least, we recognise 2 types of Wakalah arrangement ie with fees and without fees (where the fees are waived by the agent ie waiver of rights ~ Tanazul Haq). In the middle east this will be a talking point but in Malaysia, that fees is generally waived as you rightly pointed, banks will be earning from the financing itself. 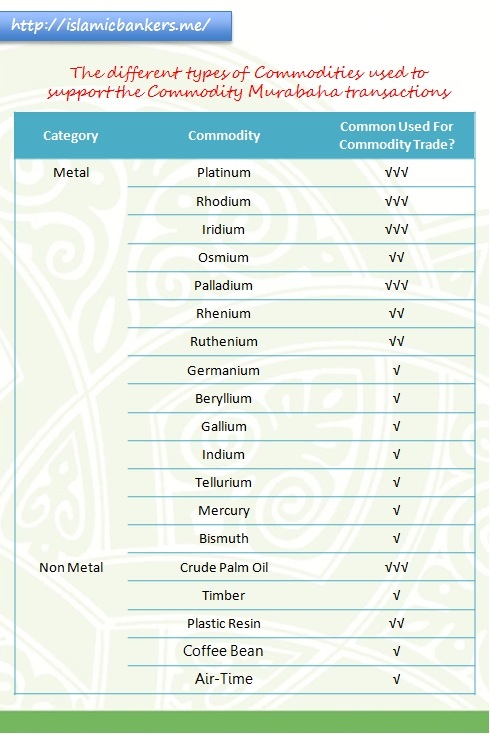 can commodity murabaha be used as term deposits by Islamic banks? Please. I believe all Banks in Malaysia have moved to Commodity Murabahah for the Term Deposits, replacing the much complicated General Investment Structures based on Mudharabah. In terms of its application under Commodity Murabahah, you have to remember that the purpose of Term Deposit is for the creation of a financial obligation that leads to profit for the depositor. For this purpose, since profit can also be derived from a sale-based transaction, Commodity Murabahah becomes a suitable structure to use. If all the Shariah requirements for Tawarruq / Commodity Murabahah can be met, there should not be any issues translating that structure for a deposit-based product such as term deposits. Can you tell me how to critically evaluate a Tawarruq fixed deposit product whether it is complying with Shariah Principle. Taken Maybank Fixed Deposit-i as example, its profit rate is predetermined and the rates is closely pegged to its conventional fixed deposit, it has make me quite confusing about the real spirit of Tawarruq fixed deposit in meeting Hariah Compliance. Hope you can clear my doubt. Thanks you very much. Tawarruq fixed deposit do comply with the Shariah requirements where the transaction meets the tenets of a valid sale (offer, acceptance, selling price, value and nature of Asset i.e. commodity), does not contain issues of interconditionality, and to a certain extent remains the most viable solution for the needs. Of course, there are always criticism on its spirit in Islamic Banking where some argued this remains a “hilah” ie legal trick. It depends on the Shariah advisors and their stance on Tawarruq. Many has taken the stance that without a viable alternative, Tawarruq remains acceptable for the public good (Maslahah) but there needs to be strict adhered to the operationalization of the contract, including the Murabahah transaction involving commodities. As for the profit rate under Tawarruq, one of the tenets for concluding the Murabahah is the certainty of the Selling Price, and there is no compulsion towards using “conventional” rates as a benchmark for finalising the Selling Price. As you know, Murabahah requires certainty and this is what makes Tawarruq possible in many deposit and financing structures. To critically evaluate it, you should consider the intention of the structure i.e. the creation of a future obligation via a sale that meets all the tenets of Murabahah. I am not a Shariah scholar but this is my opinion based on real market practice. Firstly it all depends on what is captured in the legal documents whether there is a recourse clause for such cases. Most of the time, there is none. Most of all, in such cases, you have to look at the minimum tenets required to have a Murabahah sale being valid. The Murabahah tenets are 1) Valid contracting parties ie Buyer and Seller 2) Aqad ie offer and acceptance of terms 3) Assets ie in existence with proper ownership 4) Nature of Asset i.e. transferable and deliverable and 5) Agreed Price. Any defect of these tenets renders the Murabahah invalid. So in the event of loss, the position is to return to the original condition before the “invalid Murabahah” takes place. If the purchase of the Asset has made payment for the goods, but there is no goods, the payment amount must be returned to the purchaser by the seller. But in this case, the “seller” is a fraudulent entity, ie a hacker, and therefore the seller was never the real party to the original transaction (as someone else became the seller). Unless it is proven that the “seller” is really involved in the deal, then how would the purchaser recover the payment which the seller never received in the first place. The loss will be borne by the purchaser, whom has purchased a non-existing goods from a non-existing seller. Same scenario also applies when the seller sells the goods to a fraudulent “purchaser”. If the goods was received by someone else fraudulently by the purchaser, the real purchaser was never a party to the transaction. The loss will be borne by the seller. It is an unfortunate scenario which will be best discussed in court, based on legal documents. In this case, it is hard to prove a valid Murabahah has taken place as the tenets to such sale is not fulfilled (or fraudulently fulfilled). Such scenario is not Islamic-banking specific, as such scenario may also happen in a conventional bank. It then becomes a criminal case of fraud with the fraudulent party, and it will be injustice to impose the losses into a party that has no knowledge of the transaction in the first place. That’s why under Murabahah, the risk of the goods itself is borne by the original owner until a complete transfer of ownership is made. If the transfer has been made to the wrong party, the risks cannot be passed to a party which is not involved in the transaction. It is also the onus of the accused party to prove that they are not involved in the transaction and a crime has been committed. Does gold stil consider ribawi goods or it can be treat as commodity for Murabaha Commodity scheme ? How about the financing scheme ? Gold is still considered ribawi items and should not be taken as a commodity. In your scenario, you mentioned that Person A instructs Company X to sell the gold to Person B at a certain rate. I presume the certain rate is not “actual market price” but is a price inclusive of profit. I understanding that this remains prohibited as you are buying gold at profit (not at cost) as this remains as exchange of 2 ribawi items. However, do take a look at the recent AAIOFI standards on Gold recently issued. I do not have the official English version (official translation in progress) but there are some interesting insights to the new standard. There are specific definitions to what you would consider Gold as ribawi items. I do not remember the ratio but if the percentage of gold is below a certain level or criteria, it may not be classified as gold and therefore tradable as a commodity. Interesting discussions going on, and in the future I hope to have more clarity in this. A financial institution is providing funds for commodities on Murabahah basis which are already purchased by institution. Those commodities are in physical possession as well as owned by institution. Mr. A has an argument that this type of transactions cannot be termed as Murabahah. Can anyone tell me is that true? Not really understanding the context of the question, but will try to explain. Do ask further if this is not what you asked of. At the start, the financial institution only have one source of funds, for example RM1 million cash. A customer needs financing. Once credit approval has been obtained, the customer makes offer to financial institution to purchase commodities from the financial institution at RM1.2 million payable in 1 year’s time (for example). Financial Institution has RM1.0 million cash. Upon request from customer, financial institution uses the RM1.0 million to buy commodities (as principal owner) for their beneficial / physical ownership. Now that the Financial Institution have this RM1.0 million worth of commodities, the Financial Institution SELLS the commodities to the customer at RM1.2 million cash to be paid in 1 year’s time. Customer takes ownership of the commodities (physically / constructively) and instructs a Selling Agent to sell the commodities on the customer’s behalf to obtain Cash of RM1.0 million. This usually happens in the same day as quickly as possible to avoid valuation risk or price risks, especially if the commodities are held overnight (and the price moves adversely). Financial Institution = Receivable of RM1.2 million to be received in 12 months time. Customer = Cash of RM1.0 million received immediately. As for Murabahah, the tenets of Murabahah is present when the Financial Institution sell commodities to the Customer i.e. Cost Price (RM1.0 million) Selling Price (RM1.2 million), Asset (Commodities), Nature of Asset (Transferable / Deliverable / In Existence) and Aqad (Offer to buy commodity and Acceptance to sell commodities). “cannot be termed as Murabahah” means this scenario is related or not related to Murabahah. simply means is this happened in Murabaha or not ? I’m humbled to see your passion in enlightening the masses via your blog. You certainly pull me out of ignorance. I have pretty much zeroed in on Bank Islam’s Baiti home loan, which works on Tawarruq process flow and Murabaha contract. However, I’m still having some gray areas which I hope you could kindly spare some time to resolve. My confusion is, who is the Buyer/Broker B/3rd Party? also applicable to Islamic loans, Tawarruq in particular? Thanks for the compliments and for your comments. I really appreciate it. Q1) In the Tawarruq arrangement, the underlying asset used is not the house itself, but is a third party asset ie commodity. It resolves ownership, transferability and right of sale issues usually arising in some Murabaha transactions (where the underlying asset is the house itself). Therefore under Tawarruq, the parties related to the house is not involved in the transaction; the house becomes only a collateral to the arrangement (but not the asset being traded). 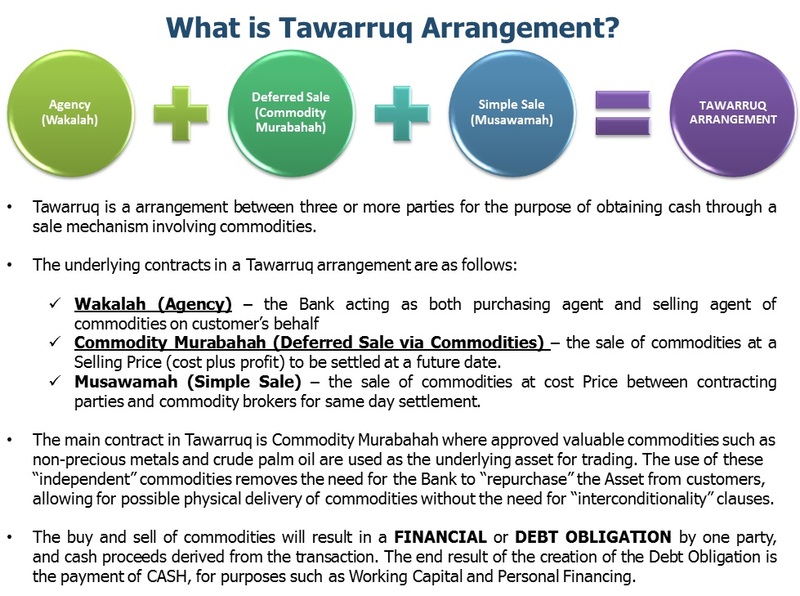 Usually under Murabaha, there are 3 parties (1-Developer or Current house owner, 2-Bank, and 3-Customer), but under Tawarruq, it is a 4 parties arrangement (1-Commodity supplier or Broker A, 2-Bank, 3-Customer, and 4-Commodity Buyer or Broker B). Therefore under Tawarruq, a debt is created between Bank and Customer, and Cash is derived from the Commodity sale which pays the Current House Owner (as a simple sale transaction). Ownership of house is transferred to Customer immediately, house is put up as collateral from Customer to Bank, and a financing debt (created from the commodity transaction) means installment is to be paid over the agreed period of time. Q2) Whether “Additional payments to reduce the principal”, a feature found in semi & full flexi conventional loans, also applicable to Islamic loans, Tawarruq. This I am not sure for the product you are considering (Baiti Home) although there are no restrictions under Tawarruq to behave as such. As long as the Selling Price is maintained for the feature, it is possible. I know a few Banks who offer full/flexi financing products, but it has been traditionally linked to a Diminishing Musharakah product. But Tawarruq, it is possible as it works just like a Tawarruq-based Credit Cards or Tawarruq Cash Line/Overdraft, where additional payments reduces the principal and is redrawable. Q3) More expensive stamp duty for Islamic products. I have to agree with this statement simply because we do have separate and individual documents for each of the products or contract. For example, a Tawarruq arrangement usually consist of Commodity Murabahah agreement and Wakalah agreement, so it is an additional document to stamp (Wakalah document). However, these additional documents only incur nominal stamping fees ie RM10 for each additional document. So yes it is slightly more expensive but not significant. More importantly, for this year (until year end 2017), don’t forget to ask Bank Islam if you can get that 20% stamp duty waiver for Home Financing residential purchases. If you qualify, it means your stamp duty is significantly cheaper than a conventional loan. Amir, thank you very much for your time. I’m clear now. Have a good day ahead. Based on my observation, I have found out that there are banks that apply Tawarruq concept for their CASA. However, based on the documents disclosed to the public, I fail to understand how Tawarruq mechanism works for CASA. It would be much pleasure for me, if you can explain how it works for CASA. Yes there are banks in Malaysia that has already started offering CASA Tawarruq and there is no standard in the market yet. Each bank would have a different design for CASA Tawarruq, with differences to cater for each Bank’s system limitation or abilities. 3) At a certain cut-off time, the Bank extracts report to find out if there is a need to purchase commodity. 4) if yes, Bank will take funds to purchase commodity. This is either done same day, or done T+1 whichever approved. 5) The Bank proceeds to purchase commodity with a 1 day Aqad or 30 days Aqad. 9) On agreed date, the profit from the Tawarruq is paid into account. Based on my limited knowledge, there are 3 type of transactions that involves CASA transaction that needs bank to perform trading using underlying asset i.e CPO/soy/coffee etc. 1. new account opening deposit of CASA – say customer is opening an account with initial deposit of RM 100 on 15th of the month, bank will trade amount of RM 100 times number of days reach to month end; 15 days, times profit rates divided by 365/366 days to get the profit at the end of the month (if the product is monthly profit paid). 3. monthly profit. – EOD balance times profit rate times 30/31 days/365/366 days. this is for profit customer will be getting at the end of the month. Withdrawal is not part of the trading as customer will be contracted to give bank ibra’ / rebates. wallahualam. Yes that is true in the scenario for CASA Tawarruq structures. Banks will either use incremental value (Net Deposit Amount) or End of Day Balances (daily balances) for the trading of Commodities. The structure you mentioned above is usually applicable for Monthly maturities, but there are some Banks that have moved / planning to moved to daily maturities (to reduce operational headaches… or not) or even yearly maturities (to reduce the commodities costs). And while the Standard allows for T+1 or T+2 commodities transactions which utilises Hamish Jiddiyah (security deposit), some Banks are looking at immediate purchase and settlement at T+0 which means lesser concerns on delays of Commodities trading. Based on your explanation, Banks may utilise Security Deposit to undertake the trading transaction. But how does the security deposit actually work? and in operational wise, how does Bank controls depositors from utilising the Security Deposit credited? Apologies for the explanation, when I mentioned “…while the Standard allows for T+1 or T+2 commodities transactions which utilises Hamish Jiddiyah (security deposit)”, I am not referring to Security Deposits given by Customers and utilised by Banks. Because the structure is a Deposit structure, the security deposit is the surety given by the BANK to the CUSTOMER that the Bank will conduct the Commodity transaction within T+2 and earn the profit. The security deposit amount is equivalent to the profit amount to be recognised, and is redrawable by the customer while the commodities transaction takes place. It is there to mean that “while the Bank is yet to conduct the commodity transaction, the Bank has made available a security deposit redrawable by the customer”, and if the transaction was completed, the profit realised will replace the security deposits. Thank you for your reply. I am aware that the SD is paid by the Bank to customer, not the other way round. However, I just wonder how Bank pays the SD to customer, does the Bank credit the SD into customers account? and will the customer know the amount of SD. Should it be reflected in the statement? Secondly, I’ve read thru HongLeong CASA Tawarruq T&C, under the SD clause, they mentioned that “SD amount cannot be utilised by customers” which contradict with your explanation “SD redrawable by customer. Is there any significance to restrict customer form utilising the SD? Lastly, if a Bank decided to trade on T+1, would it be necessary to pay SD? Would it be a Shariah issue if SD is not paid? Thanks for your questions. As for the SD being paid to the customer, the SD amount is always equivalent to the amount of profit daily accrued in the customer account. The customer won’t specifically know the amount of the SD in their statements, as it is an accrued amount not posted into the the customer’s account. It is allocated but not realised. But the amount is known to the bank when they check the account in the system. As for the HongLeong CASA Tawarruq T&C, the SD cannot be utilised by the customer, which is true. I spoken to one of the original product developer in HLIB, Ustaz Muhammad Hadi, and the method is that the SD remains as SD until the commodity murabahah transaction is conducted (which may be done daily, based on whether there is a Net Deposit Amount situation at the end of the day). Once the commodity murabahah transaction is done, the SD amount changes into profit accrued. Profit accrued will accumulate until month end where the whole accrued amount is finally posted into the customers account for them to withdraw. So you are correct to point out thats SD cannot be utilised by customer, although in my opinion is that SD should be made available to the customer if the bank is not able to conduct the commodity murabaha (the SD is the surety amount, which tallies with the accrual of profit). More often than not, the trade will be done on the same day, as T+1 may result in some shariah concerns over incidental qard. But dispensation has already been obtained for T+1 under the recent decision of incidental qard, therefore it is an option. From what I understand from Ustaz Hadi, the SD is allocated by the bank but is not paid. But perhaps the concern by Shariah will be on why SD is allocated in the first place. SD is there to give comfort that the commodity murabahah will be executed, so I presume Shariah understood in the event that commodity murabahah is not done and results in loss of income to the customer, the SD should be paid to the customer as compensation for losses. But so far, I am not aware that there have ever been a failure to execute the commodity murabaha to capture the profit from sale of commodities. I believe the SD is there to provide fairness to customers in event of failure to execute commodity murabahah. Maybe a face to face session with Ustaz Hadi will also be useful. He can answer loads of questions on CASA Tawarruq when HLIB launched the product 3 years ago. assalamualaikum, regarding to the tawarruq home financing, i can see that so many islamic banks converted the contracts that they had been used before this to tawarruq contract. Can you explain why islamic banks do that? Waalaikumsalam… there are a few reason to it, including that tawarruq is an easy to understand structure. Once people understand the purpose of the commodity sale, the structure becomes so much simpler than other structures such as Diminishing Musyarakah. Legal documentation is straight forward. For the banks, the operational risks of sequencing, ownership, asset valuation, transferability are all easier to address under tawarruq. In a banking environment where compliance is most important and making transactional mistakes can lead to financial losses, banks tends to choose a structure that operationally is less riskier. That structure undoubtedly is tawarruq. Generally, both structure is used as “working capital” facility. But the usage of both Commodity Murabahah and Letter of Credit are different. 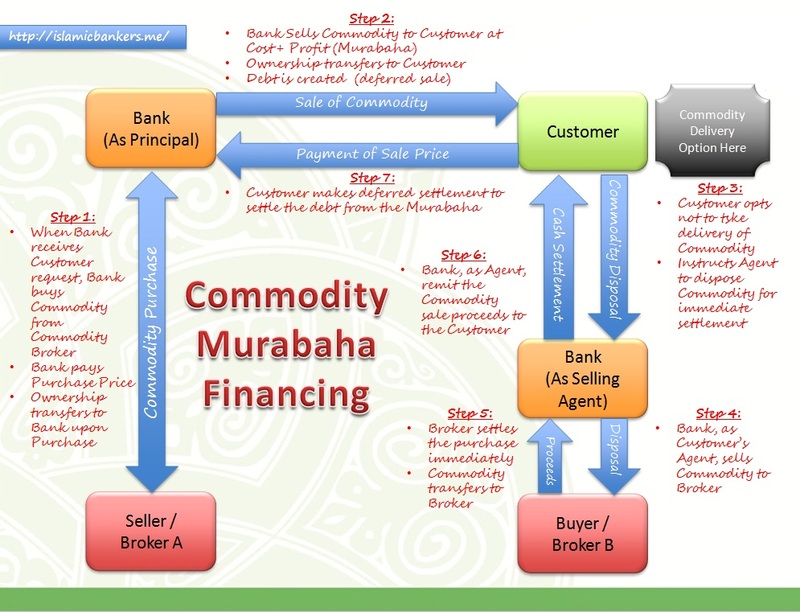 Commodity Murabahah is to generate Cash and uses Commodities as the underlying asset. The purpose of Letter of Credit is different, it is to support the importation of goods at a fee, depending whether the Letter of Credit is based either Murabahah (deferred sale of assets) or Wakalah (agency purchase of assets).It buys and transact on the underlying imported asset. salam en amir, would like to ask what is the risk if the bank is using CPO and LME to transact tawarruq transaction operationally for deposit product? In my opinion, there is no significant risks on either of the commodities as I believe for both types, there is sufficient commodities volume available for trade. For deposit products, I believe efficiency in sequencing and completion of trade is important consideration. More importantly, the choice of trading platform is cruial to support the buying and selling of commodities on non-working days, odd hours and times of commodities shortages. Not all platform are able to cater for 24/7 operations, so that is a challenge as well. Thanks En Amir. i believe there are no local (Malaysia) trading platform company using LME as an underlying asset for murabahah. hence, i wouldnt know the risk bank will be taking since trading platform company is outside Malaysia, probably in Europe/UK. can the bank rely on their (UK company that trade using LME) process although they have sharia compliant proven by their Sharia Board? Apologies for the late reply, may have overlooked your comments earlier. The trading platform residing outside Malaysia and reliant on LME do have risks as it remains offshore, but nonetheless I believe the comfort we take is that most of the platforms in used have been around for some time and tested many times by various Shariah scholars. These are the assurances we take but I agree, we have to continue to be vigilant that something do not fall through the cracks and become non-shariah compliant. Sometimes we have to afford some trust to our partners. Thanks En Amir. it helps me a lot. Perhaps my last question regarding trading is, do Sharia has any concern on commodity price that broker (buyer / seller) increase above than market value? my concern here, if customer opt to own the commodity/asset, the price he/she holds is above market value, hence will difficult him/her to sell afterwards. need your opinion on this. Thanks in advance. 3. Customer sell commodity worth $1.0 million to broker @ $10,000 per tonne for today’s settlement. Customer obtains cash. The discussion is with Step 2 where you sell the commodity worth $1.0 million for $3.0 million deferred price. So what is the actual commodity price then? Is it $10,000 per tonne or $30,000 per tonne? Is the $30,000 per tonne a realistic forecast of commodity price 30 years later, or is it an average estimation? If not, what is it? Is it also right to sell commodities worth $1.0 million for $3.0 million? The criticism is mainly on form over substance. And when the element of taking physical delivery arise, there is a risk the customer will not be able to sell the commodity into the market. 1. The purpose of the transaction is to create a debt via trade of commodities. It must be Murabahah-based as it clearly states the cost and profit and sale price clearly. The intention is to create the debt on Day One with a settlement structure over a period of time. In terms of the tenets of a valid sale, the tenets are present thus making it a valid sale i.e. Buyer, Seller, Price, Asset and Aqad. If you are transparent on the cost vs sale price, this is allows a degree of acceptability as it removes the gharar (uncertainty). 2. Willing buyer willing seller. While some may argue that the price of commodities is artificial and unrealistic, the notion that all parties are aware of the transaction (cost and sale price) and are willing to enter into the arrangement for the intended purpose gives allowance to the “willing buyer willing seller” argument. If both parties agree, and enters into the Aqad, it becomes a valid contract. The test is whether the arrangement is oppressive or not, or whether an option to decline the contract exists (not entered under duress). 3. Taking delivery of the commodity will definitely open the customer to valuation risks and market risks, but these are the risks that the customer must understand and be informed upfront of. There needs to be awareness of the cost involved to taking delivery and customer should be making informed decision on this. It is a risk, because the debt with the bank is already created but the customer do not have sufficient capital as he has taken physical delivery of the commodity instead. As long as the customer understand and willing to take this risk, there should not be any concerns when all the terms and conditions are made clear to the customer. In fact, the customer may even enjoy the upside in the market if customer decided to hold the commodity. Assalamualaikum Encik Amir. Can you explain to me more detail about critism in the operationalisation of commodity murabaha? 3) sequencing when commodity murabahah is not executed based on dual agency structures. 1) timeliness of the purchase of commodities – usually when a customer enters into the commodity murabahah transactions for deposits, the purchase of commodities are not done immediately but done on the next working day. Therefore the deposit is taken as a “loan” by the bank until the day the commodity transaction can be done. Issue is when there is a lengthy period of “non-working days” where over the weekend + up to 2 public holidays means a total of 4 non-working days where the money is taken as a “loan” (Qard). Technically, there should not be a promised returns for loan, but system has already accrued the profit. So it is up to the Bank to find an operational solution with the Shariah Committee on this profit. BNM guideline allows for T+2 delay in commodity trade, so it is an issue if the delay is more than 2 days. However this is not an issue for financing structures. 2) delivery of commodities – there are challenges in coming up with a process where there is a request for physical delivery of commodities by customer, as some banks are not exactly sure on the operational processes to meet the customer request. Simply because it is a rare occurrence, and not many Banks have experienced such request, which is a key operational requirement by Shariah. 3) Sequencing in a non-dual agency structure. Most banks employ the dual-agency structure for commodity murabahah transactions where the customer gives the bank mandate to transact as agent for the customer, on both the buying and selling leg. However, there are some banks that still employ a single agency structure. Therefore sequencing is highly dependent on the steps of the commodity to be accurate and therefore compliant to Shariah requirements. Assalamualaikum Encik Amir. i would like to ask you about the critism in operationalisation of commodity murabaha. Can you explain more detail about it? Salam En Amir, understood your explanation. really helps me. thanks a lot. Do you think it is possible to “convert” an existing financing under the shariah principle of Bai Inah to Tawarruq? Can it be done by way of a supplemental agreement to the Master Facility Agreement so as to avoid/saving stamp duty on the “converted” financing amount. Thank you. Ideally, all conversion of contract should be via proper documentation and acceptance of offer to formalise the Aqad. However, there are circumstances where exceptional allowance have been given in the spirit of legal maxims “harm must be removed” and “matters are determined by intention”. The principle we usually follow, with endorsements by Shariah Committee, is that such conversion must benefit the customer and not result in a penalisation of the customer. The purpose must be clear; the conversion is necessarily to remove harm from the customer. That is why sometimes you see a conversion done from one contract to another “beneficial contract” upon certain events. The new contract features must be on par or better than the previous ones. As to how the conversion happens, it is a discussion to be agreed with the Shariah Committee. As per your reasoning, the conversion via supplemental agreement seems acceptable as the intention is for the customer to save money (save on stamp duty), and we change it for a reasonable purpose, into a more acceptable structure. Thanks Encik Amir for your views. The conversion is unlikely to be unilateral in the sense that the Bank will issue a letter of offer/supplemental letter which will be accepted by the customer. Then that is even better as consent is obtained. But what happens if customer do not return the acceptance, would you still proceed? Or proceed under negative consent or acceptance by conduct? Some cases, we consider for acceptance by conduct that if the customer do not come to object, we will proceed, with the intention of giving the customer a better deal or benefits on the conversion. But if the conversion will lead to a diminished benefit for the customer, a consent is usually required. What is the major difference between Commodity Mudharabah/tawarruq with Musharakah Mutanaqisah as a home buyer? Currently had 2 offers from 2 banks which one is doing CM and another doing MM. Bank with MM stated thing like advance payment and redraw facilities plus security issue like return of payment if the property is deemed incomplete (developer bankrupt etc). Purchase price is RM930k. both banks willing to give 90% + mrtt + legal fee loan. Bank with CM (4.25%, 30 yrs, mrtt 20yrs) while Bank with MM (4.28%, 32 yrs, mrtt 24 yrs). Which one will be better to choose? I am used to CM as my previous property is under CM concept but this MM concept is new. From the reading at https://islamicbankers.me/islamic-banking-islamic-contracts/musharaka-mutanaqisa-diminishing-partnership-bba-murabahah-bai-inah-islamic-financing/ it said it is more shariah compliant. In Malaysia, the products that we manufacture depends mainly on the preference of the banks and its Shariah Committee. Some committees have no issues with Commodity Murabahah while other do not accept Commodity Murabahah. If the Bank do not want to develop Commodity Murabahah, they will develop other contracts such as Musyaraka Mutanaqisah (MM) for their clients. Personally I see this as a choice of products achieving the same end. I don’t believe one is more Shariah Compliant than the other. In Islam, differing views are allowed based on individual interpretation and acceptance. MM as a structure do seem like a more flexible alternative as compared to Commodity Murabahah (which is essentially a debt-based structure). MM, in essence tries to be closer to the idea of “equity-based financing” but yet it can be argued it’s still closer to “debt-based” structures. I think the major difference between MM and Commodity Murabahah is that Commodity Murabahah is still based on the maximum Sale Price for its contract, whereas MM relies on the “rental collection” which can move from time to time without restriction on how high the rental rate can go. On the flip side, Commodity Murabahah also solves most of the issues faced by MM with regards to the property such as land titles, transfers of ownership and registration as owners. Under Commodity Murabahah, these issues are avoided as the underlying Asset is not property but commodities, as the proxy underlying asset. The simpler nature of buying and selling commodities makes it a preferred choice for most Banks, forced to adhere strictly to its processes.It is a debt creation instrument. Assalammualaikum sir, can you explain to me, what is completion and termination process of contract commodity murabahah? Not 100% sure of your question, because there are some elements to it. But I will try, and do feedback if this is not what you meant. Are you referring to the completion and termination of the Commodity Murabahah transaction itself, or the debt created by the transaction i.e. the Murabahah? If you meant the process of the commodity murabahah itself, it is completed when the whole sequence of transaction is done, resulting in the debt being created. Starting point is the purchase of commodity by the bank at cost price from the suppliers, ready to be sold to customer. The completion is when the commodity is finally disposed to the commodity market. But termination, in the process of commodity transaction (? ), is when the tenets of valid transaction is not met. For example, execution of the sale of commodity when the purchase point is not completed yet. This results in a defective process or transaction and therefore termination can take place with consent by the parties. The second scenario is whether you are asking if it is completion and termination of the contract itself ie the debt created after the transaction. In a commodity Murabahah, all the transactions are concluded and closed except for the Murabahah debt. Completion of the murabahah debt means the murabahah obligations is concluded and closed once the selling price have been fully settled as agreed. It has nothing to do with the commodities anymore, as only the debt from the transaction remains. Termination of the debt, on the other hand, is usually linked to events of default, where there is a breach in terms of contract. This means the debt from the murabahah is accelerated and all payments or outstanding profit and principal becomes immediately due for settlement. There are many views in this, but it all depends on the actual scenario presented to the Shariah Committee. In Shariah, there are several concepts we can consider, and it all boils down to intention of the transaction. If a customer provides money to purchase commodity but the Bank fails to execute, the Bank has the obligation to complete the transaction, and at the same time cannot penalise the customer for the Bank’s failure to execute. Failure to execute as per given mandate means the responsibility is held by the bank. Some banks delay-execute the transaction but execute nonetheless; some banks pay hibah; some banks return the monies… it all depends on what Shariah approves. And whatever approach taken, it can be formalised contractually so it will meet Shariah requirements. The main intention it must meet the legal maxims to provide justice and remove harm. As long as it is in the best interest of the customer. Thank you so much for your reply , is the facility considered void ? Or shd execute supplemental facility agreement to that effect ? Or shd the profit earned to be Channeled for charity purposes? Thank you in advance sir , jazakallah. Again the answer is not so straightforward as Shariah Committee must make a decision on what is the right decision. All factors should be considered but more often than not, rectification is always preferred than just declaring something void which results in charity payments. Supplemental agreements that rectify and formalise a transaction is always better, and usually the other parties will be supportive to ensure the transaction is done correctly. Shariah team and business should work together and ensure that all Shariah requirements are met. Hope that helps. Assalamualaikum, sir. may i know what is your recommendation and suggestion of tawarruq financing. please let me know about your reason. Not sure about your question. Tawarruq is an acceptable financing structure in Islamic financing, especially dealing with working capital. The flow of commodity confirms to a valid Aqad of ownership transfers. It has a wide usage and financial application at the moment, used by many financial institutions. Dear Sir, I would like to know how much ibra or rebate given normally to make full settlement for loan tenure 15 years amount RM30000 in 2010. Now the balance is RM 45000. The total loan amounted RM 61000 for 15 years plus the inerest. The Ibra Guidelines comes into force in 2011 where all Islamic financing, existing or new, will be given mandatory Ibra by the Bank. Unfortunately before 2011, the Banks are not required to give a schedule of payment on the Ibra and the settlement amount, otherwise you can easily see the amount. But just ask your bank what is the principal amount outstanding at the moment, as that will be the settlement amount for you. So if now your balance is RM45,000 and the principal amount outstanding is RM20,000 (assuming theres no late installments) it means your early settlement amount is RM20,000 and your Ibra (rebate) is RM45,000 less RM20,000 ie RM25,000.The settlement amount you have to make is RM20,000 which should be the same if you had taken a conventional loan. No extra charge. Give a call to the bank and ask the early settlement amount. The difference between that and the outstanding balance of RM45,000 is your Ibra. Maaf saya ingin bertanyakan soalan berkaitan property financing – tawaruq bank muamalat. Saya telah membuat pinjaman ini utk membeli rumah pd 2015. Pinjaman sy berjumlah RM355k. Interest 6.9% – max 10% . Awal tahun ni, oleh kerana busines sy alami masalah kewangan, jadi sy telah tidak membayar instalment rumah melebihi 3 bulan . Sya terima surat lawyer mewakili muamalat meminta sy menjelaskan tunggakan atau buat fullsettlement RM 1.3juta. Dan oleh kerana tidak berpuas hati atas misc chargers dan pengiraan bank, sy telah tidak byran hingga 8bulan. Process lelong akan dibuat pd 26 / 1/19. Saya berasa sgt tidak adil dan tertipu. Mohon encik amir dapat bantu. Sy juga telah buat appoitmnt pd 7/1/19 dgn peguam Ong Yu Jian yg baru2 ini( disember 2018) menang kes di Federal Court . Kes Attorney Lawrence Bourke vs Cimb. Tetapi disebabkan ini isu islamik banking , saya merasa risau dan kes ni memberi pressure pd saya. I think there must be a miscommunication somewhere. Because the regulations are very clear. Betul Bank Muamalat akan claim di mahkamah RM1.3 juta, untuk process lelongan. Tetapi, bergantung kepada how much is collected from the lelongan, the amount claimed back from the bank must include rebate (ibra). Scenario 1: Jika harga lelongan = RM500,000 then, RM390,000 akan buat settlement with bank dan RM110,000 akan dipulangkan to you. Perbezaan diantara RM1.3 mil less RM390,000 is the rebate (as provided under the BNM guidelines). The amount is the same as if you take conventional loans. Scenario 2 : Jika harga lelongan = RM300,000 then, RM300,000 akan buat settlement with bank tetapi masih ada jumlah perlu bayar RM90,000. Jumlah ini perlu diselesaikan untuk mendapat rebate, so the longer the amount remains unpaid, the more profit the bank can earn (just like the conventional amount) but it will not exceed RM1.30 juta in total paid (conventional loans may exceed). If you manage to settle the outstanding RM90,000 then the rest will be given as rebate. The point is the claim may be RM1.3 million but the settlement must only be RM390k (principal outstanding and profit due) + any other legal charges due. Jadi in terms of amount to settle, it is the same as conventional loans, therefore there should not be an issue of unfairness or being tertipu. In fact dalam scenario 2, the rate the Bank can charge to you (shortfall RM90,000) should be lower than what a conventional bank will normally charge. Your lawyers should be conversant with the regulations on Ibra, and the process of claims under islamic banking. InshaAllah the treatment will be consistent with what BNM has prescribed for Islamic banking. All the best in solving your case.